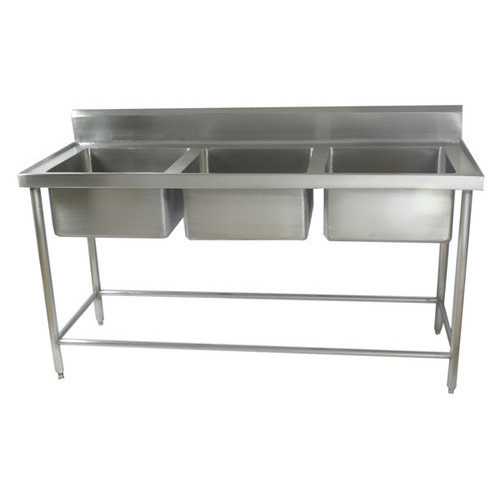 With our rich industry experience, we have established ourselves to offer a wide array of SS Three Bowl Kitchen Sink. These products are manufactured by the experts using high grade quality components. Moreover, to ensure the compliance of the offered products with the defined industry standards and quality parameters, these products are tested on various levels by quality experts. Also we are providing these products at leading market price. Established in the year 2012, Steel Planet is known in the market as leading manufacturer and wholesaler striving for total customer satisfactions by offering superior-quality, excellent-performance and user-friendly Kitchen Equipments. Our wide range of products includes Cooking Range, Kitchen Work Table and Kitchen Trolley and many more. These products are highly treasured due to their robustness, rust resistance, excellent strength, efficient performance and high durability. All our products are manufactured from the quality tested raw material and cutting edge technology as per the industry set norms. Within short span of time, we have been successful in catering to the requirements of our esteem clients across the market. We are backed by state-of-the-art infrastructural facility, segregated into number of departments. Our production plant is installed with cutting edge technology and modern set of machinery. All the units are managed by our expert team of professionals, who work with dedication and following industry recommended guidelines. Moreover, we conduct stringent quality checks at various stages of production, designing, assembling, and finishing. We have been able to acquire goodwill in this competitive market segment Leveraging on technological advancements, skills of adept professionals and a strong marketing network, we are successfully catering to various requirements of clients.